Mysteries of History: Painted Ponies: Carousels of Wonder ~ The History Girl! When I sit and daydream about my younger years, it always propels me to the county fair. First, a colorful piece of cardboard, nailed to the telephone pole. Then, the anxiety would begin and would not subside until I stepped foot on the midway. Scents of food merged with one another, but I could pick out each one: cotton candy, hand tossed pizza, fried dough, and my ultimate favorite that can not be mimicked anywhere but the fair, Italian sausage with peppers and onions. Before I could enjoy the thrills of the Roundup, the Galaxy, and on some occasions the rollercoaster, the best amusement ride of all was when I climbed upon a colorful outer row jumper horse of a musical carousel. The carousel dates back to the Byzantine Empire around 500 AD; it was first developed as an aid to help equestrians to become more skillful for their service to the empire. 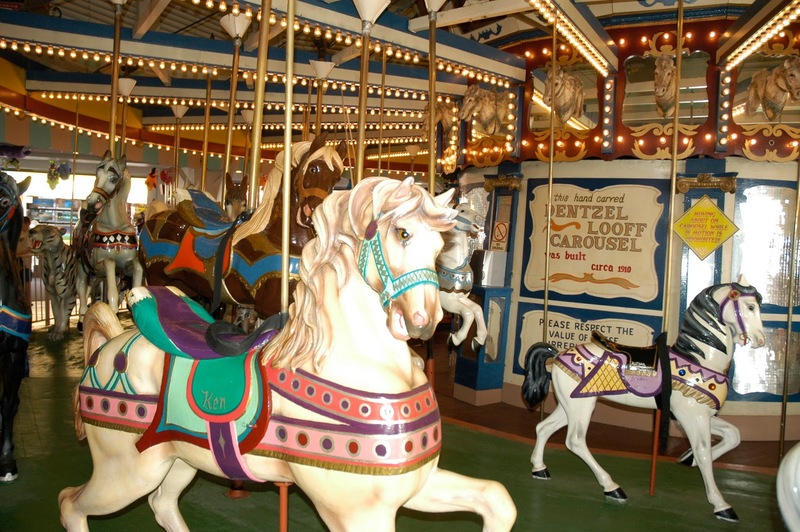 For the modern day carousel that has delighted children of all ages the world over, it began in 1740, by a wagon maker in Germany, named Michael Dantzel. He converted his simple wagon business into a name that, until this day, is respected by collectors worldwide. During the winter months, the business would stay busy hand-carving animals, modifying the mechanisms and preparing for a tour of Europe. Springtime not only brought fresh beginnings in nature, but also brought the Dantzel Company touring another season with their large Menagerie Carousel to visit various fairs. By the 1840s, the United States was home to several construction companies that specialized in building various carousels. The Philadelphia Toboggan Company and the Charles I.D. Looff Company built the stationary Coney Island style. Allen Herschell and the C.W. Parker Company built machines to be easily set up for traveling fairs, which manufactured the portable County Fair style carousel. Each carousel was handmade and many of the animals carved during this era are highly sought-after by collectors. The twentieth century not only brought style that appealed to young children with bright colors and menagerie, it also moved along with technology and the invention of electricity. This once simple animal powered machine was now electric with its movement and majestic display of colorful lighting. As the years progressed, this once masterful craft of hand carved wooden animals were now being mass-produced, pushing the artist into a studio to work on projects for personal pleasure. Although the carousel’s heyday is long gone, and has been for many years, I will never forget the power that it held over me. If I want to rekindle that powerful force, all I have to do is visit one of the specialty amusement parks that speckle the countryside. Climb upon one of the outer lane jumpers or cuddle with my girl in one of the elaborate chariots and enjoy the scent of foods and the beautiful music that can only be found at the fair. Dentzel -Looff Carousel at Casino Pier, Seaside Heights, NJ. Built circa 1910.